Has Baghdad Bob Moved to Tehran? American reporters gave Mohammed Saeed al-Sahhaf, the Iraqi Information Minister under Saddam Hussein during the American-led invasion of 2003, the disdainful name "Baghdad Bob" (and the British called him "Comical Ali"). He spouted wildly inaccurate propaganda during his daily press briefings, praising the Iraqi troops and telling fabulous tales how they crushed the foreign invaders, even as those invaders could be seen on the screen moving in on him. 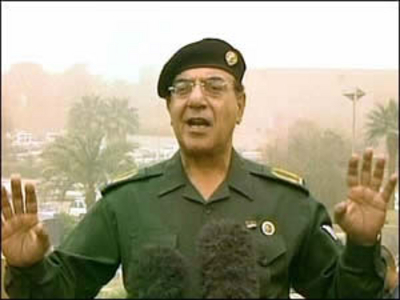 Mohammed Saeed al-Sahhaf, the Iraqi Information Minister known as "Baghdad Bob." Brigadier General Hossein Salami, lieutenant commander of the Islamic Revolution Guards Corps: "The IRGC is never intimidated by the hugeness of the aircraft carriers and the roaring of missiles of U.S. and trans-regional enemies, and their equipment is nothing more than rusty iron in its eyes." 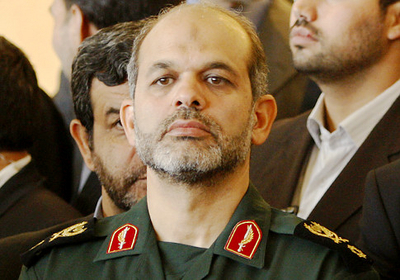 Brigadier General Hossein Salami, lieutenant commander of the Islamic Revolution Guards Corps. 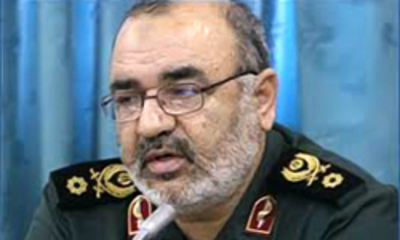 Brigadier General Ahmad Vahidi, the minister of defense, in a telephone conversation with his Syrian counterpart just as he took over from his assassinated predecessor, paraphrased by the Islamic Republic News Agency: "Iran is confident that Syria's powerful defense system will make the United States, its regional allies, and Israel back down from their plan of achieving their goals in the region. He said the Zionist regime and terrorists can not affect Syrian army's strong will and can not build a stronghold for Israel through psychological operations in Syria." Brigadier General Ahmad Vahidi, the Iranian minister of defense.